Send a microchip, get a medium-resolution .JPG image of the die in 5-10 days by email. Send a microchip, get a medium-resolution .JPG image of the die in 5-10 days by email. In China these services are used to verify die markings, but they'll also stitch together an image of the whole chip. The result isn’t a beautiful high-resolution decapping image, this is Dirty Decapping! The top of the chip is etched away, generally with nitric acid-based nasties, to reveal the die and bonding wires. A series of medium resolution photos are taken through a microscope and stitched together. 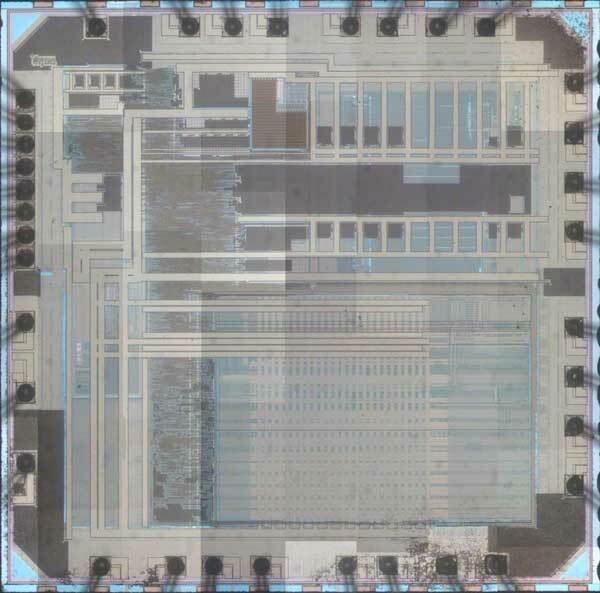 The resulting image is clear enough to verify a chip’s identity, and generally determine different areas on the die. You definitely won’t be able to identify individual gates or reverse engineer the chip, for that you need to find an expensive high-quality service. Be sure to check if this real example will suit your needs before ordering. Unless pre-arranged, all decapping images are added to an open source die database under a Creative Commons 0 license. Decapped chips cannot be returned. Example decap photo of ATMEL 168 clone chip. Click here for full resolution version. To get started just purchase the decapping engineering service and send us your chip (or tell us were to get it). Note the limitations below: this is medium quality, stitched image.